Cormac McCarthy – The Road: Anything that combines my favorite southern literature writer and science fiction has got to be good. And it was. My only complaint is that is wasn’t Stand-like in length as well as tone. Tom Franklin – Smonk: I really liked Hell at the Breech, but this was too over the top for me. I thought parts of it were amusing, but on the whole I was disappointed. Michael Lewis – Blind Side: A buddy of mine gave me this book. I hadn’t read any of Lewis’s books since Liar’s Poker. It is a very good read. I learned a lot about college football recruiting. The part where Lou Saban and Phil Fulmer go to the kid’s house is worth the price all by itself. William Gay – Twilight: I love all of Gay’s books, including this one. It’s not quite on par with Provinces of Night, but average William Gay is still better than the best work of almost anyone else. I’m looking for something new to read. Recommendations appreciated via Comment. Posted on February 9, 2007 December 29, 2012 by KentPosted in LifeTagged books. I saw this on OmegaMom’s blog and thought it was cool. 5. Don’t search around and look for the coolest book you can find. Do what’s actually next to you. Mitch crawled out on his porch. From my copy of An Unfinished Life, which I just got back from a friend. Boring sentence, but a fantastic book. Posted on April 26, 2006 January 2, 2013 by KentPosted in LifeTagged books, memes. Posted on January 22, 2006 January 1, 2013 by KentPosted in TechTagged books. Robert Scoble and Shel Israel’s long awaited book on blogging is now available at Amazon. The book, entitled Naked Conversations, is a why-to guide for business blogs, taking the position that almost every company should have a blog. I have ordered it and am looking forward to reading it. Scoble’s blog has been the town square of the blogosphere for a long time, so if you had to pick one guy you’d want to teach you about blogs, Scoble would definitely be it. 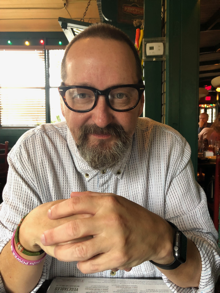 Shel Israel is a well known expert on innovation and was involved in the development of PowerPoint, FileMaker and Sun Microsystems workstations. If you want to know more about these guys and their book, they have a blog about the book and related topics. I’ll post some more thoughts once I get into the book. In the meantime, congratulations to Robert and Shel! Posted on January 16, 2006 by KentPosted in TechTagged books. There are only a few authors that I really, really like. Cormac McCarthy, Kent Haruf, William Gay, Charles Frazier (who seems to be a one and done guy), maybe a few more. Sadly (more for him than me, I guess), my favorite writer, Larry Brown, died recently. Since the guys I like write something like one book every 5 years, I need to find more good writers to fill my reading needs. Fortunately, I found a new one. 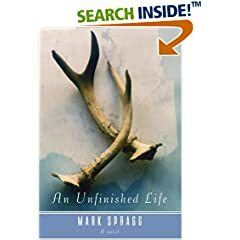 I just finished An Unfinished Life by Mark Spragg, and it was utterly excellent. If his other novel, which I have ordered from Amazon, is as good as this one, he may become my favorite writer. His characters are deep and believable. His dialog is perfect. I really like this book and have high hopes for more good books from him. I learned after reading this book that it has been made into a movie by Robert Redford, which would have concerned me had I known that before I read the book because of the “chick book” implications. I can’t speak for the movie, but the book is in the Kent Haruf, William Gay mold- only maybe a little better. When I was reading the book, I did think about who should play the characters in a movie (although I didn’t know about the movie at the time). Morgan Freeman is the only choice for Mitch, and he plays him in the movie. Redford is a horrible choice for Einar- Einar is older and much tougher. Jennifer Lopez as Jean also strikes me as a “get fannies in the seats” choice. Elizabeth Shue would be better. The girl who plays Griff is new, but she better be good and cool, because the character she plays is both. It’s a rare treat to find a good new author. I hope the movie does the book justice, but based on the cast, I bet it doesn’t (other than Morgan Freeman). Posted on November 16, 2005 by KentPosted in LifeTagged books. 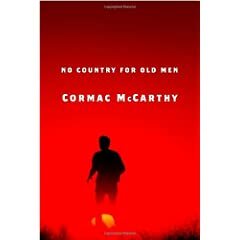 I just finished No Country for Old Men, the new novel by Cormac McCarthy, one of my favorite authors. It’s set in 1980 Texas, where a working man stumbles across a drug deal gone bad and makes off with a bunch of drug money, only to be relentlessly chased by a bad man named Chigurh and a Sheriff named Bell. By anyone else’s standards it’s a mighty good book, but it’s not up to the standards of McCarthy’s prior work. I thought it was interesting, but not compelling. Yes, I caught a little of the literary and biblical references and I have read that there are a lot more. But if I wanted to do a puzzle, I’d do a puzzle. Many of his prior books contained passages in Spanish. It was fun to try to read and understand those, because they added to the authenticity of the book. Here, the puzzles just weren’t worth solving. I just read over them. I embrace the idea that the drug war is a bloody war fought by dark and anonymous forces. I liked Sheriff Bell and appreciated that he is the one of the last of a dwindling breed. But books are about the story, and the story just didn’t grab me. Blood Meridian and the Trilogy are among the best books I’ve ever read. This one is not. It’s OK, worth reading. But not a literary force like the others. Posted on November 6, 2005 by KentPosted in LifeTagged books. Tom Evslin has posted the first installment of his blook (a book serialized on a blog) at Hackoff.Com. The novel takes place during the dot.com bubble and bust period of 1999-2003. It involves the murder of the CEO of a network security company, who was, it seems, a reformed hacker himself (see the “Chat Board” comments). The neat thing about this project is the depth of the experience you get via the Hackoff.Com website. Not only can you read each chapter as it is posted (chapter 1 is up and chapter 2 is scheduled for 9/22/05), you can also click around to embedded links such as the link to the fictional company, and once you’re there to normal company related “About Us,” “Team,” “Support,” and even “Careers” pages (I think the job posting for “Portfolio Manager” is notable). The story begins with the CEO’s death in 2003, but chapter 2 will go back to 1999, as the company works towards its IPO. Based on chapter 1, I’m interested in seeing where the story goes and look forward to reading, and experiencing, this project. It’s early but so far it reminds me of a more immersive Michael Crichton experience, which, in my book, is high praise. One minor criticism: I don’t like it when movies use gratuitious cursing, and I don’t like it when books do it either. It is virtually impossible to offend me and, as my secretary will attest, I have been known to use a lot of colorful language. But I don’t do it around my kids or other kids. There is a word used on the fictional chat board that simply doesn’t need to be used. Granted, kids are unlikely to read this blook, but there are other less offensive words that could have easily been used for the same effect (the “b” word, while still a curse word, would be less offensive). I think that as blooks become more common, we need to keep in mind that they will be more accessible than traditional books (now I’ll step off my soapbox). You can read Tom’s blook via the web site (which I recommend for the total experience) or via RSS or email subscriptions. Posted on September 18, 2005 by KentPosted in LifeTagged books.